New York Attorney General Eric Schneiderman speaks at a news conference after a DACA hearing at a Brooklyn court on Jan. 30. New York state is leading a group of 17 states in a lawsuit to try to remove a new citizenship question from the 2020 census questionnaire. New York state is leading a group of 18 states, 10 cities, four counties and the U.S. Conference of Mayors in a lawsuit against the Census Bureau and Commerce Department to try to remove a new citizenship question from the 2020 census questionnaire. It was originally filed April 3, more than a week after California filed a similar lawsuit in San Francisco federal court against Commerce Secretary Wilbur Ross, who oversees the bureau, and Census Bureau officials. The city of San Jose, Calif., as well as a group of individuals from Maryland and Arizona, have also taken separate legal actions to block the citizenship question. 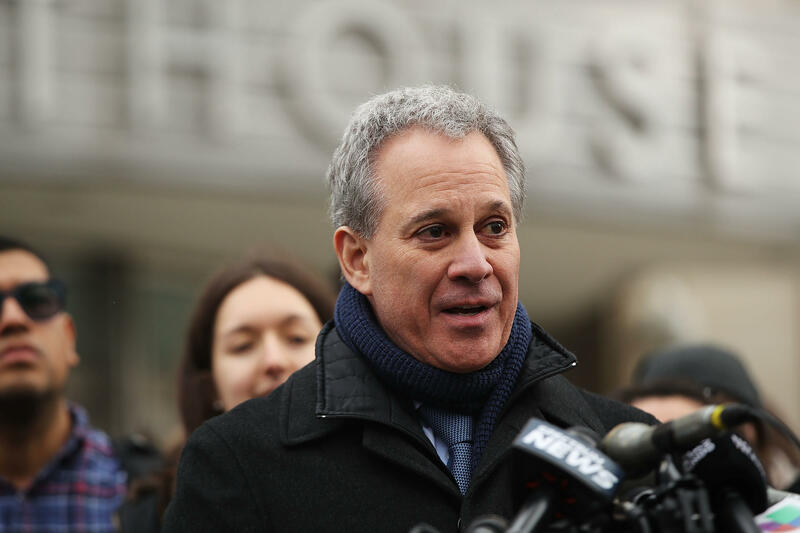 The states joining New York State Attorney General Eric Schneiderman's lawsuit filed in Manhattan federal court are Colorado, Connecticut, Delaware, Illinois, Iowa, Maryland, Massachusetts, Minnesota, New Jersey, New Mexico, North Carolina, Oregon, Pennsylvania, Rhode Island, Vermont, Virginia and Washington. The cities include two sites of the 2020 census test currently taking place in Rhode Island — Providence and Central Falls — as well as Washington, D.C.; Chicago; Columbus, Ohio; New York; Philadelphia; Pittsburgh; Seattle; and San Francisco, plus the United States Conference of Mayors, a bipartisan group. California's Monterey County and three Texas counties — Cameron, El Paso and Hidalgo — have also come on board to sue the Trump administration. The census has not asked all U.S. households about citizenship since 1950. The Justice Department requested the question be added back to the questionnaire so it can enforce the Voting Rights Act with a better count of voting-age citizens. But New York and other states are alleging that adding the question is unconstitutional because it would undermine the government's constitutional responsibility of counting every person living in the U.S. every 10 years. Their complaint also alleges that the addition of a citizenship question violates the Administrative Procedure Act because there are sufficient citizenship numbers already to enforce the Voting Rights Act and the change does not meet the Census Bureau's own standards for testing new questions.